Think back to that old-fashioned pharmacy, the one that held down a street corner of your hometown for generations. The one that existed long before the big-box stores threw a pharmacy counter into the back of a convenience store and called it a drug store. The one where the pharmacist knew your name, knew your family and always greeted you with a smile. It’s maybe thought of as a relic of a bygone era. One of the things we wish we hadn’t allowed ourselves to lose in the march to modernity. To those elegizing the end of the corner drug store, there’s good news. That old-fashioned hometown drug store lives on at Bluffton Pharmacy. While the footprint of Bluffton Pharmacy has remained largely unchanged in its 30 years as Bluffton has grown around it, that’s not to say they haven’t kept up with the latest in treatments and technologies. In addition to the ancient art of compounding, Sauter and his team have adopted all manner of cutting-edge advancements and new techniques, from essential oil aromatherapy and anti-aging collagen to hormone therapy. It’s that level of personal care you’re simply not going to find within the vast soulless aisles of the big chain stores. And it’s hardly the only advantage Bluffton Pharmacy has over them. 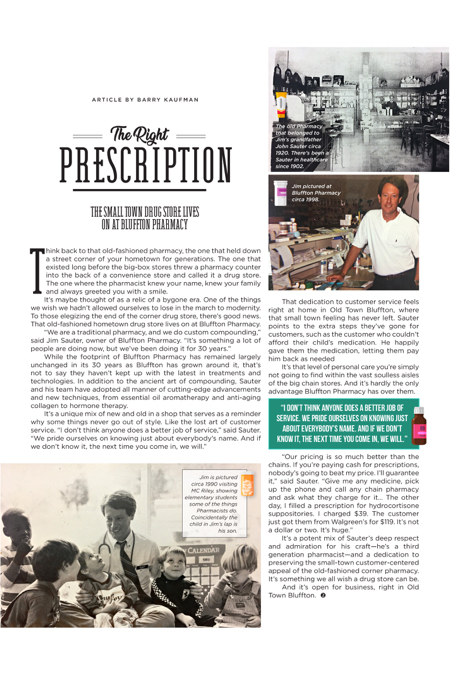 It’s a potent mix of Sauter’s deep respect and admiration for his craft—he’s a third generation pharmacist—and a dedication to preserving the small-town customer-centered appeal of the old-fashioned corner pharmacy. It’s something we all wish a drug store can be. And it’s open for business, right in Old Town Bluffton.